We know you have seen them, they look like buttered leather and are worth every ohhh and ahhh when seen by your family and friends. Mexican tile is a treat to decorate your patio, home, entertainment room or even that special dining area with spectacular colors. Did you know that with Mexicatn Tile Floors you will have little upkeep; and the gorgeous tiles with proper cleaning will be spectacular over the life of your floor. Types of Mexican Tile – There are several types of Mexican tiles. Here in Texas, Saltillo tile tends to be the one most people mean when they are referring to Mexican tile. Proper Mexican tile is a form of terracotta tile or quarry tile and is clay-based and made in Mexico. It comes in all shapes, colors and sizes. The same shape in varying hues is a typical design using Saltillo tiles. When placed in the sun to dry, you may even see imprints of area leaves, animal tracks and interesting shapes of designs that bring out a wonderful aesthetic. Manganese and Antique Mexican tile is more textured than most Saltillo tiles. While less common some say they make a powerful visual impact. Encaustic or cement tile is durable and colorful and definitely can stand up to high traffic and be laid out in any number of designs. The Talavera painted tiles are abundant in color and design choices, and give an authentic feel to any project. Clean Mexican Tile Naturally – Sparkle in your Saltillo Mexican tile is easily maintained by a professional like Keith Clay. 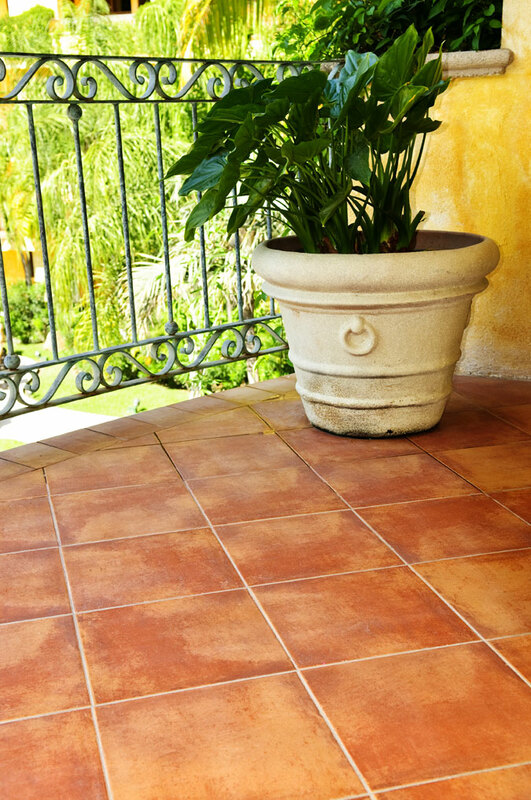 If there isn’t much damage or inches of grime or debris, it will be easy to sweep the Saltillo tile to remove any fine dust and get it as dirt-free as possible. To maintain it’s beauty, a mixture of warm water and distilled white vinegar will do the trick. A hand mop is ideal for this job because it will gently float over the tiles and let the solution work its way into the crevices. A sponge mop may also be used without worry, particularly if you have stubborn smudges of grease or oil from cooking that need a bit more work expecially in a patio or kitchen setting. Start from one corner and end at an exit before allowing the tiles to dry. With a clean mop, rinse the tiles with warm water and air dry. Clean with Detergents – If you have inherited a new home with some discoloration from build-up of previous cleaners or soap scum, you may want to reach for solutions with astringents specifically for these types of Saltillo natural tiles. To remove serious stains, you will need to contact a qualified staff member here at Keith Clay Floors. Keith can use a standard floor machine and a stripper, which will remove rust stains. If it is a serious stain, Keith can discuss a more acid based cleaner which can be rubbed into a serious stain and let it sit before wiping away those pesky stains. These procedures will enable the beauty of the tile to shine through. Keith Clay Floors works with almost any kind of hard surface flooring product. From hardwood floors the ceramic tile floors, from Mexican tile floors to brick floors, from marble floors to polish concrete floors, and many more. Old World Charm & Ambiance is by far the way your Mexican Tile floors can be described. For over 30 years, Keith Clay has served the North Texas Region with his skill in installing Saltillo and Mexican Tile floors. We know wood floors and can answer any questions you may have. If you want the best job from a company of professionals, call us today. 972-463-6604.